Dream Skin's Bust Care Treatment can be arranged to be received in-conjunction with menstrual cycle, by doing massage with drainage and nerve reflex effects during the period of hormone secretion, it stimulates breast plasma absorption of fatty acids in fat cells, leaving a healthier and fuller breast. Effectively stimulates the production of collagen, repairs scar-forming tissues. Extracted from soybeans, water-soluble protein is very rich in cysteine​​, is a very important sulfur-containing amino acids, can enhance the moisture, keeping skin smooth and soft. 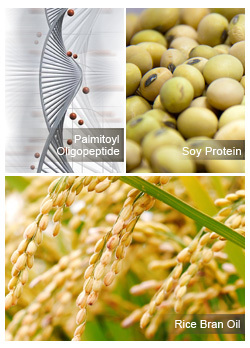 Natural Plant Proteins. Contains Vitamin A, the main elements for purifying and whitening, smooth skin’s mucuous layer, harden damaged wound. Suppress formation of melanin. Protein, Vitamin A and C ensure even skin tone, bright and stable. Lecithin is one of the important component for cells, it plays a role of nerve conduction and energy use during the growth of cells. It also helps in transportation of vitamin A, D, E, K, which is beneficial for brain blood vessels and liver.